While watching Ultimate Recipe Showdown on Food Network we watched this guy score very high with his Northern Italian Burger. It looked nummy, oh so very nummy…until I looked up the recipe. It was laden with diet unfriendliness. The horror! Well, I had to fix this since I was still determined to have this unusual burger. I was so intrigued by the use of capicola in the patty. Fix it I did. It’s not an everyday burger, definitely still reserved for a special occasion but now it won’t bust this gut. Combine and chill the ingredients for the herbed margarine. heat a skillet to medium. Sprinkle 2 tbl of parm cheese in a circle. Cook 1 minute, flip, cook 30 seconds more. Drain on a papertowel. Repeat 3 more times to make four frico. Combine the first 5 ingredients of the patties in a bowl. Form into four patties. Grill or skillet to desired doneness generally 3 1/2 minutes, flip, cook 3-4 more minutes. Toast buns if desired. To assemble: Butter the buns with the herbed margarine. 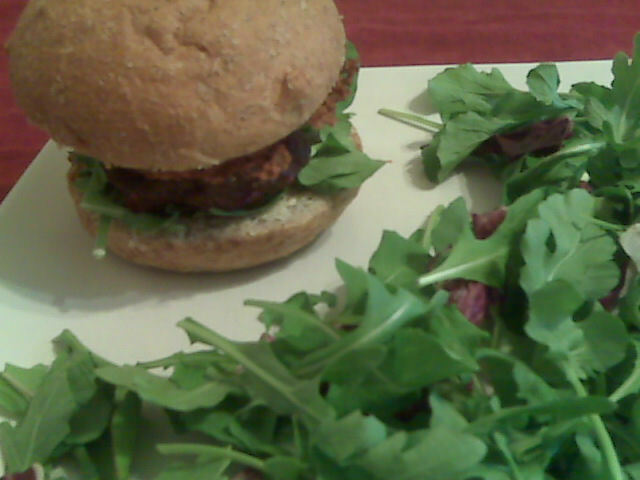 Starting from the bottom here are the layers, bottom bun, 1/4 cup baby arugula, patty, frico, and top bun. Serve! This makes four servings. I recommend serving these with either the potato bun recipe mentioned in this blog or a nice whole wheat kaiser as pictured. Each serving without the bun is 275 calories, 19 grams of fat, and .2 grams of fiber. No need for any other condiments I find, the herbed margarine and cheese makes this burger so very awesome! This entry was posted in Craving Buster, Dinner and tagged Beef. Bookmark the permalink.